The two-character play is set in a cemetery in a small and impoverished West African village, where the Master of Ceremonies and African “Sayer,” Tibi by name, conducts his daily funerals – which are attended by both mourners and foreign tourists, who have been sent by their travel agents to witness “the real Africa.” In the course of honoring the dead, consoling the bereaved and sharing his African predicament with the tourists, Tibi discovers his long-lost girlfriend, whom he rescues from her now-abysmal condition. The play is translated by Cohen (with David Carroll) from Jean Verdun’s Mieux que nos pères (Paris: Detrad, 2001). The world premiere was directed by Cohen at Stages Theatre Center in Hollywood in 2003, with Saul Williams and Erinn Anova in the cast; Williams won the L.A. Weekly’s “Best Male Lead Performance of 2003-2004” for his portrayal of the title role. 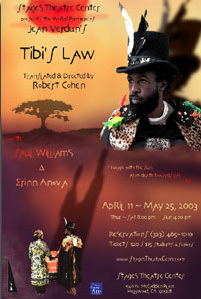 Tibi’s Law has subsequently been produced at the National Theatre of Ghana (2004), and has been published in Theatre Forum, 2004 and Plays International. Mieux que nos pères had its French premiere at the Theatre de Troisième Oeil in Angers in 2005. English-language performance rights are available from the author. “Cohen’s translation and direction are superb. TIBI’S LAW is a must-see production for Los Angeles audiences. —Willard Manus, Lively Arts. TIBI: Ladies and gentlemen, thank you for coming! As your travel agency has told you: “the most beautiful burials, the most authentic ones, are those in which Tibi officiates.” Well, I am Tibi. And you will be satisfied. Oh, don’t be afraid! Banish your fears! No one here will accuse you. You’ve come to attend our burials, and why not? You’ve paid for them. I certainly won’t accuse you. I, too, am affronted when they call you “morbid spectators of poverty and death.” I live off of death. No, I don’t think you’re morbid. There are people who delight in slapstick humor, others who love ballets (I do too! ), others who long for clever comedies, and still others farces that ridicule women – and men who are deceived by women. But you, tourists, you came here to see and to understand. Tragedy attracts you! Well, I will give you what you have come for. Here, everyone says to me: “Make us cry, Tibi! Make us cry leaden tears! Well, ladies and gentlemen, your travel agency has not misled you. With Tibi, tears are guaranteed!